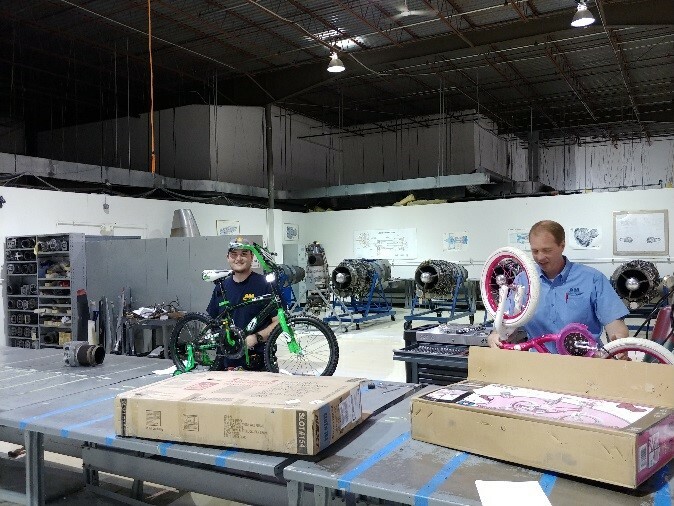 Posted January 25, 2019 by Tidewater Tech & filed under Adult Education, Career Training, Certifications, Spotlight Feature, Trade School, Welding. Joseph Parker poses for a photo at the campus. Tidewater Tech grad Joseph Parker lived in Raleigh, North Carolina when he realized it was time to get serious about his future and make a change in his life, for the better. He had been thinking about welding but did not know where to start. Then, one day he received a call from Centura College about furthering his education in the medical field, but he was more interested in pursuing welding. 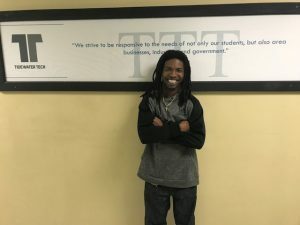 He was soon connected with Tidewater Tech and found that was where his future needed to go. He moved to the Hampton Roads area to attend Tidewater Tech’s combination welding program. Joseph found inspiration in welding from his uncle, who was a welder. He saw the financial security that came from succeeding in the trade. As a father, he knew he needed to better himself in order to provide a more secure future for his children. Midway through his program, more struggles came from his living situation. He found it hard to stay motivated with a tiring travel, school, and work schedule. With the added stress of not knowing where to live, Joseph almost gave up hope and quit the program to move back home to North Carolina. However, his family in North Carolina encouraged him to stay positive, finish his program, and graduate. Eventually Parker was able to obtain stable housing. “Honestly, my biggest support system was (the) student services (at the campus), my girlfriend, and my immediate family,” Parker stated when asked what helped him get through the welding program. 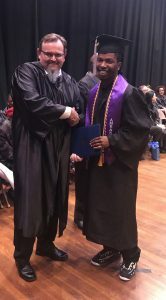 Joseph Parker (right) at graduation. Graduation finally arrived and you could see the unmistakable joy on Joseph’s face. He knew he has persevered through positivity. Armed with American Welding Society certifications, he had completed his program with pride. Parker always came to campus with a smile on his face despite being tired or discouraged. He always made it a point to stop by and say hello to everyone he ran into each day. He quickly found that staying active and involved on campus helped promote the positivity he needed to maintain his momentum throughout the program. As a Tidewater Tech student ambassador, he was heavily involved in campus activities promoting school spirit and encouraged other students to stay positive no matter what. Life doesn’t end at graduation though. Joseph has plans for his future. He has since interviewed with several companies and most recently interviewed at Bay Metal where he hopes to fully begin his career. 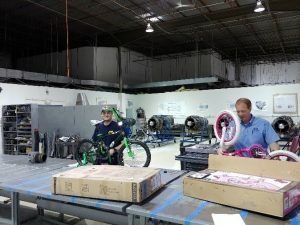 He plans to move up within the company to a Senior Welder position and eventually be able to purchase a home for him and his family to live life with a little more security. 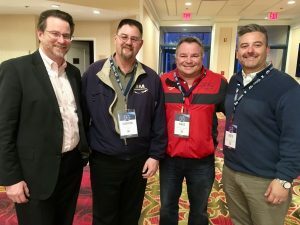 Posted November 6, 2018 by Tidewater Tech & filed under Adult Education, Building Maintenance & Repair, Career Training, Certifications, HVAC, Spotlight Feature, Tidewater Tech Trades, Trade School, Trade School, Virginia. 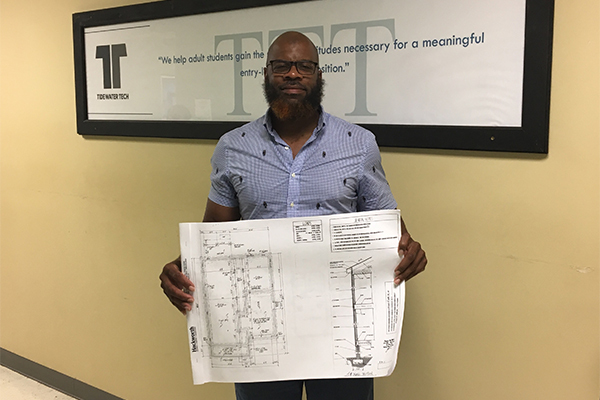 Tidewater Tech grad Tony Jones holds up blueprints for the house he plans to build. Tony Jones was born and raised in Portsmouth, Virginia. 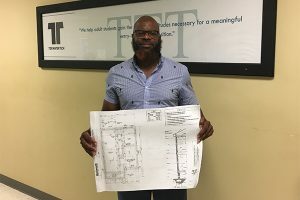 Having prior construction experience in addition to attending courses at Tidewater Building Association, with a specialty in Auto CAD (Computer Aided Drafting), he desired to further his education and academic experience in the trades and construction field. With that, Jones enrolled here at Tidewater Tech. Growing up, Tony always desired to someday build houses and had a knack for hands-on learning and skills, leading him to the trades field. Tony first enrolled at Tidewater Tech in the (BMR) Building Maintenance and Repair program in January of 2017, graduating later that year, in August, with a cumulative enrollment GPA of 4.00. Promptly following graduation of the BMR program, Tony then enrolled into the Heating Ventilation and Air Conditioning (HVAC) program to further his education in September 2017, graduating on June 10th of 2018 with an overall GPA of 3.43. When asked his review of Tidewater Tech in regards to skills and knowledge he obtained throughout both the Building Maintenance and Repair and the Heating Ventilation and Air Conditioning programs, Jones stated that he believed he obtained necessary skills to feel confident in anything from interviewing, creating resumes and cover letters, to successfully having the knowledge to obtain employment in his field of interest. 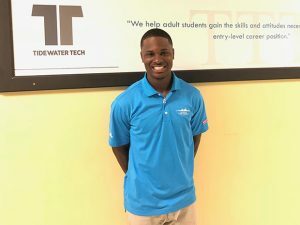 “The instructors and staff whole-heartedly want you to succeed,” Jones commented when talking about his time at Tidewater Tech, after graduating from both programs. In regards to support systems, Tony recognized his family and friends outside of school. 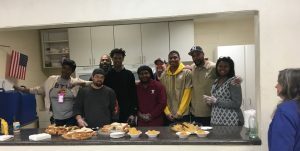 “They were constantly encouraging me and checking in on me as far as how I was doing and where my grades stood.” Additionally Jones noted, “The whole administration, staff and instructors, all played major keys in both recognizing and supporting me”. Since graduating in June, Tony enrolled in Villanova University, with goals to obtain his certificate in Project Management in order to acquire the necessary knowledge, skills, and hours to get his PMP Certification. Additionally, Tony is associated with Virginia Organizing, where he assists individuals who’ve been directly affected by anything from lack of health insurance, affordable housing, to the school to prison pipeline. Not only is Tony active in his local community, but he also is the Director of a youth mental health program, HYPE (Helping Young People Everywhere), where he utilizes his past experiences to educate and advise young people. 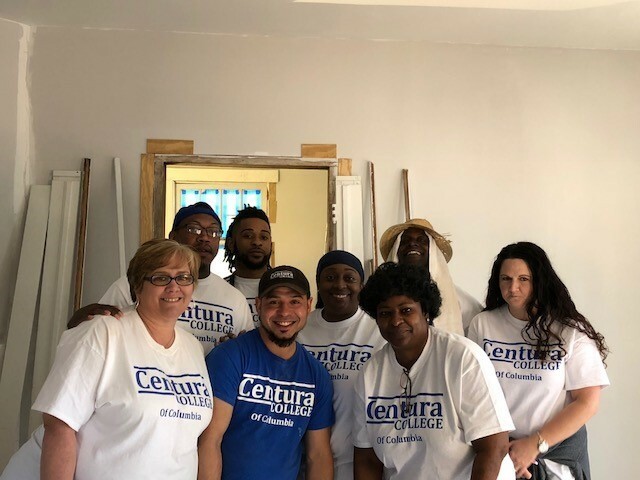 Jones has partnered with both Tidewater Tech and Centura College for multiple back-to-school supplies drives in working towards giving back to the local community. When discussing Tony’s long term goals, he brought his blueprints of the first house he wishes to build and sell once he gets his developing company started. He discussed his prior education and how it has all played vital roles in all of the knowledge he’s obtained throughout his academic journey thus far. Best wishes go out to you Tony. Your family at Tidewater Tech knows you can do anything you put your mind to! 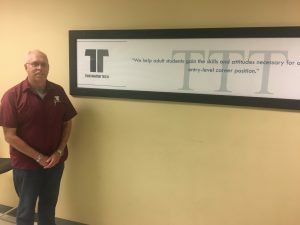 Posted August 1, 2018 by Tidewater Tech & filed under Adult Education, Lifestyle, Spotlight Feature, Tidewater Tech Trades, Trade School, Virginia, Welding. When Lemuel Davis starting talking to his life coach about his future, he never imaged how bumpy the road was going to be. Finishing high school, Davis felt a little lost with his life. Like most young adults, Davis was not sure what to do with his future. After talking to his life coach further, she offered some tough-love advice. She said, “Lemuel, its either boots or books. You need to pick one, and start building your life”. Heading those words, Davis started looking into different schools and trying to find the thing that fit him best. After talking to his aunt, who was a superintendent at BAE Systems Ship Repair, Inc. for welding, he thought about going into welding himself. He called Tidewater Tech and got some more information about the school. After coming and completing a tour of the campus, meeting the instructors, and talking with the Student Services department, Davis was completely sold. He started coming to school and soon found out that he was a natural at welding. Lemuel would come to school extremely excited and eager to learn; however, his instructors did not meet him with the same excitement. They noticed that he was very good at welding, but they also noticed that he was the youngest person in the class. They started speaking to him about what it is like actually being in the field of welding, and how it can be a little stressful. Conversations in the field can be very tough to get through. The instructors started treating him the same way he would be treated if he was out in the welding field. This left Davis feeling a little discouraged, but when he started to understand why his instructors were doing this, he greatly appreciated it. The instructors were forcing him to have a stronger backbone. That way he could be more confident in his chosen profession. As the weeks went past, he discovered that he was the best welder in his class. Unfortunately, this allowed him to grow a bit overconfident. He started thinking that he did not need to come to class, and complete his work. Obviously, this led to a downward spiral. His grades started to drop, his attendance fell, and he started to lose hope. He got to a point where he wanted to stop and drop out of the welding program. He felt drained and guilty for allowing his arrogance to block him. After an instructor, Mr. Sellers, started speaking life back into him, Davis started to feel better about coming to school. Mr. Sellers told him, “You’re not good at welding if you’re not a good student”. Something about that conversation struck with Lemuel and made him want to better himself. So back to work he went. He started coming back to school and fully utilizing his resources on campus. He started to form a very strong relationship with Campus Executive Director Paula Massey, and Career Service Coordinator Damika Howard-Wayne. Those two staff members helped keep Davis on the right path. Any day that he missed, Howard-Wayne and Massey were texting, calling, and emailing him. The emotional support that the Tidewater Tech faculty and staff demonstrated is what got Lemuel through the rest of his time at the school. After weeks had gone by, Davis was doing very well again in school and he started to find a good balance between his confidence and humility. It was all smooth sailing until graduation, or so he thought. In the midst of completing his welding training program, Davis got a call from BAE systems, offering him a position as a welder. He was over the moon with excitement, pride and happiness. However, with every high, there can be a very deep low. Soon after receiving the job offer, his mother and Davis ran into serious financial situations. Those situations led to a lot of uncomfortable changes in his life. Just as he started dealing with that, he found his brother dead. His brother was dealing with a lot of depressing thoughts and in the end, committed suicide. Needless to say, this rocked Davis’s world to the core. He was finally on his mountain top, only to be thrown right back down in the trenches. Davis’s whole world was being turned upside down and inside out. He did not see a way out of his situation, and being honest, school was the very last thing on his mind. That did not stop Lemuel though. He started this walk and he was going to finish it. Davis definitely leaned more on his family here at Tidewater Tech to help him get through these rough times, but in the end, it came down to his own perseverance. He did not allow adversity to stand in his way of his future. He was completely committed to seeing this all the way through. He came to school every day and allowed his education to be a way of escape from his reality. Davis understood that coming to school was going to be the best way to get him out of the situation that he was in, and he did just that. Davis graduated in December 2017, with a career and a renewed confidence. He soon discovered that he wanted to start a foundation of his own. He wishes to help other families get through the tragic loss of suicide. He is naming it NFL—Never Feel Lonely. Even through life’s ups and downs, Davis pushed through and did not allow anything to stop him from achieving his dreams. He truly is an inspiration to us all. 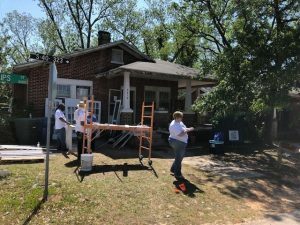 Posted June 19, 2018 by Tidewater Tech & filed under Adult Education, Building Maintenance & Repair, Career Training, Lifestyle, Spotlight Feature, Tidewater Tech Trades, Trade School. It’s no big secret that the life of a foster child can be filled with both physical and emotional struggle. About two-thirds never go to college and very few graduate. In a society where many young men and women live with their parents well into their 20s, foster children learn quickly that they are their own responsibility. Damika Howard-Wayne (left) and Breeanna Miller (right). Breeanna Miller, a recent graduate from Tidewater Tech’s Building Maintenance and Repair (BMR) program, came to terms with that fact that very quickly once enrolling here at Tidewater Tech. Her success story reflects parental stumbles, teenage resilience and the collective efforts of families, friends, foster parents and Tidewater Tech staff, all who helped her battle her demons, nurture her talents, and endure whatever hardships she had to face. Spending parts of her adolescence squatting in broken homes, a part of America’s social services system, Breanna never imagined herself attending post-secondary schooling. Not only did she complete the BMR program, but she graduated with honors, and held office as one of the campus’s student ambassadors. During her time as student ambassador, Miller displayed an incredible sense of caring through a number of campus activities. 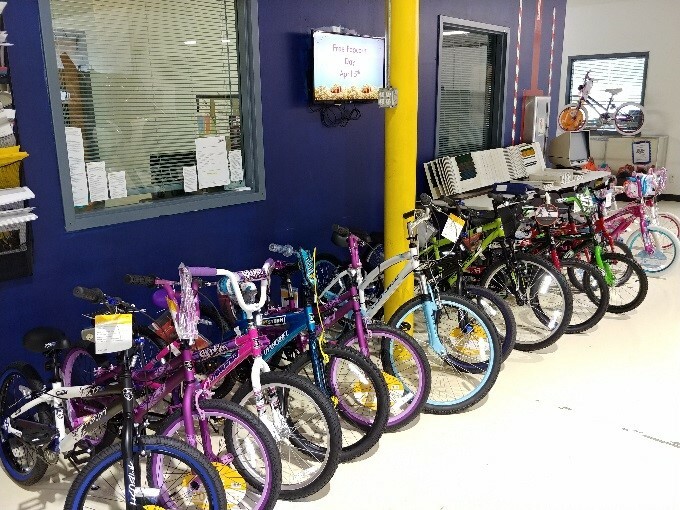 In October 2017, Ms. Miller donated over 250 pairs of socks and gloves for children, women, and men to the Tidewater Tech campus. Ms. Miller also took time out of her busy schedule to assist with feeding the community, volunteering at numerous community events hosted by Tidewater Tech. With the help of Ms. Miller, the BMR department won the campus’s winter food drive, donating over 100lbs of nonperishable items. Ms. Miller even began tutoring fellow students and assisted in a rideshare program for students who wanted to be in school but did not the means to make it to classes. School served as a primary source of stability in her life. “I’ve always been focused, having my stuff together,” Miller said. However, feeling a sense of abandonment when she knew she was going to graduate and no one was going to be there, she started reaching out to her family and traveling to be with them. That caused her to begin to miss a number of days. This drove the campus to take action. 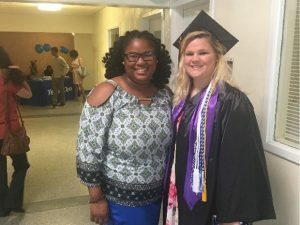 Breeanna received a call from Damika Howard-Wayne, Student Affairs at Tidewater Tech, who told her that the campus was there for her and ready to see her walk across the stage at graduation. Breeanna took those words to heart, and when the day came for Tidewater Tech’s commencement ceremony, Ms. Miller received her diploma with pride. Miller has now joined the AmeriCorps and continues her mission in helping others succeed, with no excuses. 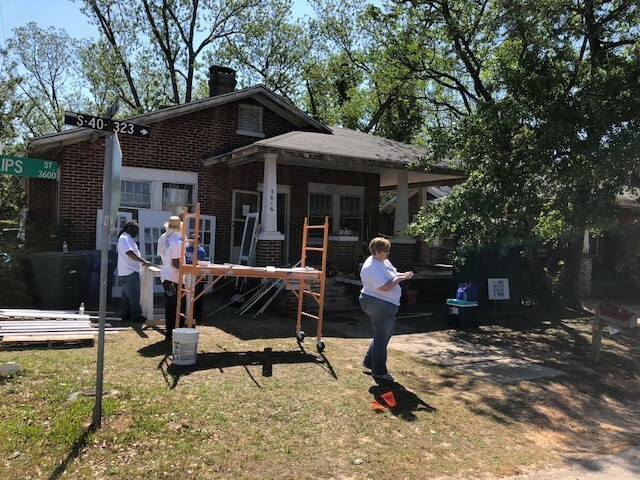 Posted May 23, 2018 by Tidewater Tech & filed under Community Service, Lifestyle, Tidewater Tech Trades, Trade School, Virginia. Posted April 25, 2018 by Tidewater Tech & filed under Adult Education, Career Training, Community Service, Lifestyle, Tidewater Tech Trades, Trade School, Virginia. For Christmas, AIM Indianapolis decked the halls with charity organizations, Bearded Villains and Bad Apple Offroad, to collect gifts for Toys for Tots. The holiday event gave families the chance to come to the campus and enjoy food, music and fun, while raising donations for a great cause. Posted April 3, 2018 by Tidewater Tech & filed under Adult Education, Career Training, The Arc of Welding, Tidewater Tech Trades, Trade School, Welding. OSHA’s Hazard Communication Standard requires your employer to provide information and proper training on the hazardous materials that are in your workspace. Understanding the dangers that come with the various materials you work with can help you determine which compounds are harmful when you are overexposed to them. Product labels inform you of safety precautions, warnings and any special procedures to follow. Always read the labels! Position yourself so that you are not breathing in fumes by staying upwind. The greatest concentration of fumes are in the fume plume. Keep your head out of this space. Do not weld in small confined spaces that have little to no ventilation. An adequate ventilation system located within the room reduces gas and fume buildup. Natural, mechanical or local ventilation partnered with fixed or moveable exhaust hoods aid in extracting pollution from your work space. To achieve maximum results, keep fume extractor guns and vacuum nozzles close to the plume source. If you feel that there is not enough ventilation, a NIOSH approved respirator may be needed. The next time you decide to weld, whether at home or on the job, be sure to keep these tips in mind to ensure that you stay safe! “Controlling Hazardous Fume and Gases during Welding.” Occupational Safety and Health Administration, March 2013. Posted March 6, 2018 by Tidewater Tech & filed under Adult Education, Career Training, Tidewater Tech Trades, Trade School, Virginia. Librarian/ Learning Resource Center Assistant – Librarians and Learning Resource Center Assistants provide you with the proper tools, books and reference materials you need to help with your assignments and studying. This also can include tutoring services for when you are in need of extra support. Bursar – The Bursar Department is responsible for some of the financial aspects of a school. They assist with billing, monitoring account balances and collecting balances due. Veteran Services– Veterans Services helps veterans adjust in the transition from military life to civilian life. The department introduces veterans to benefits they have earned from their service to the country. Registrar – This department keeps track of all your student records and class enrollments. They are your go-to person to help you find any files, such as attendance records, grades and transfer/transcript information. Financial Aid – The Financial Aid Department provides you with information on what aid options you are eligible for. They can also offer suggestions for grant or scholarship opportunities. Career Services – If you are about to graduate, or have already graduated, the Career Services Department can assist in the search for a job. They perform mock interviews, help write resumes and coach you on interview attire and demeanor. Career Services also can arrange opportunities for you to meet with employers face to face at the campus. Student Services Coordinator – A Student Services Coordinator has established relationships in the community that you may use to your benefit. Through their connections, they can help you look for things like housing, transportation and daycare, all while you’re attending school. They are also in charge of the campus’s Office of Disability Services, so if you have questions about academic accommodations, you can speak with them. This is just a glimpse of what college service departments can help you with. The next time you have a specific question, use this information to help guide you to the correct department!